NAMED A TOP 10 BOOK OF 2018 BY NPR and THE WASHINGTON POSTWINNER OF THE LOS ANGELES TIMES BOOK PRIZE IN CURRENT INTERESTFINALIST FOR THE NATIONAL BOOK CRITICS CIRCLE NONFICTION AWARDThe instant New York Times bestseller, "A must-read for anyone who thinks 'build a wall' is the answer to anything." --EsquireFor Francisco Cantú, the border is in the blood: his mother, a park ranger and daughter of a Mexican immigrant, raised him in the scrublands of the Southwest. Driven to understand the hard realities of the landscape he loves, Cantú joins the Border Patrol. He and his partners learn to track other humans under blistering sun and through frigid nights. They haul in the dead and deliver to detention those they find alive. Plagued by a growing awareness of his complicity in a dehumanizing enterprise, he abandons the Patrol for civilian life. But when an immigrant friend travels to Mexico to visit his dying mother and does not return, Cantú discovers that the border has migrated with him, and now he must know the full extent of the violence it wreaks, on both sides of the line. As Cant� tells us what he learned, he bolsters his point  that it's hard to comprehend the border from books. This one challenges the reader to find the meaning, or some sense, in its loosely strung episodes, fragmentary encounters with border crossers and agents, clippings from books Cant� has read and the surreal dreams that haunt his fretful nights.... The last third of the book, as Jos� and his family desperately fight his deportation, with Cant�'s considerable help, makes a useful contribution to the literature of today's border. It lays bare, in damning light, the casual brutality of the system, how unjust laws and private prisons and a militarized border have shattered families and mocked America's myths about itself. Much like the surveillance cameras, Mr. Cant� takes it all in, and The Line Becomes a River gives us an intricate portrait of a complicated region... By 2012, Mr. Cant� is out of the Border Patrol, which comes as little surprise. He goes back to school. And it's the latter part of the book that is most compelling, especially when describing the human cost of migration. THE LINE BECOMES A RIVER is personal and emotional, not some everyday debate about immigration. It has nothing in common with an insufferable shouting match on television. The details are rough and the story is real, yet the contact between Cant�'s own story and those of the Mexican migrants is dignifying.... It is a rare border story that connects more than divides, yet Cant� incorporates compelling immigrant stories to which every American family can relate in some way. Cant�'s writing is engaging and straightforward. At times, it is achingly lyrical... Cant�'s portrait of Mexico as the backdrop for border crossings comes to feel too unrelentingly bleak � all mutilated bodies, crushing poverty and crumbling towns. Some readers might lose patience with the author's conflicted feelings about a job he stuck with for years. But if they are interested in life on a border that has recently occupied an outsize role in policy debates, they will learn a lot. ...a book that whips across your face like a sandstorm, embedding bits of the desert into your skin that, like it or not, you'll carry forward.... If the book ended in 2012, when Cant� left the Border Patrol, it would have been an enlightening but ultimately flawed work. Getting closer to a subject doesn't always make it clearer, and if there is clarity, it can be the clarity that comes from seeing only a slice of the subject: step to the left or right, and the view dramatically changes.... The final and most powerful section of the book occurs away from the border, when Cant�, now a graduate student and coffee barista, befriends Jos�, an undocumented groundskeeper. Mostly, "The Line Becomes a River" is about Cant� himself. That's not to say he is narcissistic or blind to the scope of his subject. Indeed, one of the lessons he learned from his stint with the Border Patrol is how quickly the border strips migrants of their identity and how that loss of identity has toxic consequences � when we dismiss migrants collectively as "illegals," they become easier to mistreat and dismiss. By sorting out his own humanity, Cant�'s thinking goes, he might better appreciate others'.... The imperfection of Cant�'s approach, though, mirrors the messiness of the crisis he's facing. A more hard-nosed report in the style of the late investigative reporter Charles Bowden might expose squandered resources, corruption and broken policy; a more intimate memoir like Reyna Grande's "The Distance Between Us" would have a stronger emotional pull. Cantu's struggle to do right by both themes is, if not surmounted, at least palpable. Cant�'s writing is spare, graceful, and full of the details that propel a good story.... Cant� interrupts occasionally to bring in the perspective of academics to illuminate his experience. These interludes often feel unnatural, interrupting a gripping human tale. His life on the line has made him the kind of expert we need to hear from. 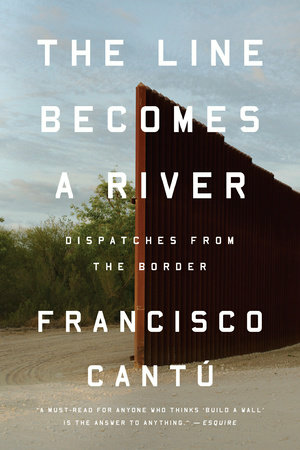 Timely and thoughtful, Francisco Cant�'s memoir, The Line Becomes a River, puts a human face on the thousands of immigrants who cross the border illegally each month, and reveals the conflicting emotions of the Border Patrol agents who must try to stop them.... Cant� worked a border area of Arizona and, later, was a higher-level agent in El Paso. He details how the agents routinely destroy water jugs, food and clothing left behind by fleeing immigrants, as well as chase them through the desert, and feel remorse afterward. But he also describes many instances of kindness and compassion.